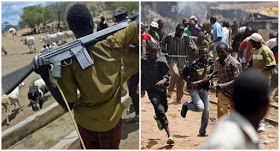 News reaching us has it that suspected militant herdsmen on Tuesday evening, reportedly killed a 75-year-old man and 14 others in what looks like a sustained coordinated attack on communities in Logo and Ukum local government areas of Benue state. We gathered that the affected communities in the latest attacks include Gbeji in Ukum local government area, Ukemberagya/Tswarev ward, Channel One community, Orveren and Ajura villages and Tombo community in Logo local government area of the state. “it all started two days ago but Tuesday evening between 6pm to 9pm was when the fully armed herdsmen came down heavily on the affected communities. They went to Gbeji in Ukum local government area and had a free day. They burnt down houses and killed about 8 people in the community and injured many. They did not stop at that after that operation, they came down to Ukemberagya/Tswarev ward in Logo local government area, at Channel One community of Tswarev clan and killed two people, burnt down houses and one motorcycle there. They came unchallenged from Tungwa in Nasarawa state to attack our communities and after the operation they usually pulled back or retreat to where they came from. Among victims already identified in the attack were Mtserkyaa lgbugh, Kananfa Amarfu, Tyavyar Akau, Orfega Hiikyaa, Kanyitor Uor, and a 75-year-old whose identity was yet to be ascertained. Reacting to the renewed attacks in the state, Benue State Governor, Samuel Ortom described herdsmen attacks on Benue communities as an extension of the terrorism being perpetrated by Boko Haram in the North East.